This lesson plan is designed to teach preschool aged children about the story of Abraham and Sarah and the miracle of the birth of Isaac. It could be used in any setting with children age 2-5 at church, including a preschool Sunday School class or a preschool children’s church class. It highlights the need to trust God and wait for Him to keep his promises. As always, consider your own ministry context and modify it as needed. Please leave any feedback or suggestions for improvement in the comment box at the bottom of this page. Learning Objectives: After this lesson, the children will demonstrate an understanding of the story by answering questions. Worship: Use the “Abraham, Sarah and Isaac Songs” (extra print out) to lead the children to sing before the Bible lesson. You can also browse our other preschool worship resources. Use a timer and have the children wait for 30 seconds. Don’t tell them how long they will be waiting, but have them be quiet until they hear the bell of the timer. It will seem like forever to them! After the timer goes off, talk to them about waiting and what it’s like to wait for a special toy or a visit from someone. Read Genesis 15:2-6 & 17:5,15-17,18 & 21:1-3 (NIRV) aloud to the children. There is also a book that you can print out that has the story along with simple pictures to help the children understand what is being read. 6 Abram believed the Lord. The Lord accepted Abram because he believed. So his faith made him right with the Lord. 5 “You will not be called Abram anymore. Your name will be Abraham, because I have made you a father of many nations. 6 I will give you many children. Nations will come from you. And kings will come from you. 1 The Lord was gracious to Sarah, just as he had said he would be. He did for Sarah what he had promised to do. 2 Sarah became pregnant. She had a son by Abraham when he was old. He was born at the exact time God had promised him. 3 Abraham gave the name Isaac to the son Sarah had by him. Discuss the Bible Reading: When you are finished reading the story the second time, ask the children the following questions so that you can know they understood it. Abraham and Sarah had to wait. Have you ever had to wait for something? (allow for responses) Sometimes it’s tough to wait when we really want something. Today we are going to practice waiting. We are going to play a game called, “Wait and Go”. Has anyone ever played “Red Light Green Light”? (allow for responses) This is the same game. Start them game by not making them wait long…as the game continues or if you have time to play it again…make them wait longer each time. “What was our Bible Verse about today? (allow for responses) God was telling Abraham that he and his wife, Sarah was going to have a baby. We are going to learn more about this story later and how special this was for them. God also told Abraham that he would have as many descendants as there are stars in the sky. Descendants are people in the same family, like grandmas, grandpas, aunts, uncles, cousins, brothers, sisters, moms, dads, you, your children, your children’s children, and so on. How many stars are in the sky? (allow for responses) There are millions of stars in the sky. That’s a lot of descendants to have. What God was telling Abraham was that he was going to be the father of many nations. Let each child glue the Bible Verse onto their tent. Need More Ideas? 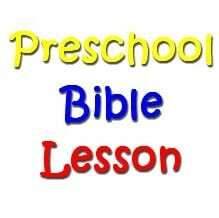 Then learn the preschool song “My God is So Big” or check out all our preschool Bible lessons. Great lesson but misleading as the resource given for Abraham, Sarah and Isaac are not included in the $9 purchase of the 100 Bible Color Sheets. Disappointing links. I’m not sure what you are talking about. Our website is 100% free. It’s a different resource…not this site. Almost everything there appears to be paid and once you provide email for a free thing, it’s almost-daily solicitation emails.